The Freedom From Religion Foundation is so upset that Senator Marco Rubio has been tweeting quotations from the Bible, they wrote him a hot letter about it. Professing themselves to be wise, they became fools and say Senators quoting the Bible is a “constitutional violation”. 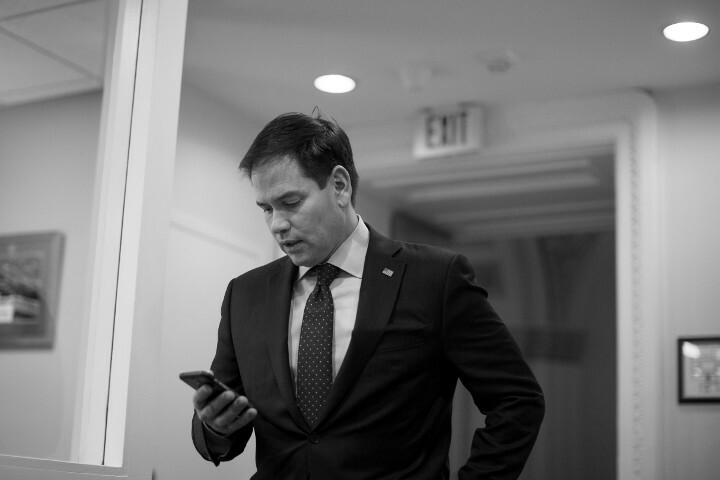 We understand that you have been tweeting bible verses from @MarcoRubio to nearly three million followers. It appears that you began tweeting the bible in mid-May and have been doing so regularly ever since. This is not an errant bible verse or two, but more than 60 bible verses in three months. That’s enough verses to tweet the entire Book of Jude. Twice. That’s a lot of tweets! The comic image of a group of spotty, oh-so-rational, atheists tallying Rubio’s tweets with word counts of Biblical books is something we can all appreciate. Jude comes in at a mere 460 or so words, depending on the translation. Anybody can tweet that much. If Rubio wants to match Jeremiah, which runs around 33,000 words, he’s got his work cut out for him. It’d take over two thousand tweets! Why do the Freedom From folks say quoting the Bible is a “constitutional violation”? Because Rubio has “intimately entwined” his Senatorial position with Twitter, “creating the appearance of official endorsement” of Christianity. I know what you’re thinking, but there is no point in dismissing these idiocies because they are absurd. They are absurd, but absurdity is no longer a bar to government action. Just think: we have a Supreme (note the adjective) Court that says two men can claim to be married to each other and that you too must agree with that claim. That’s absurd. We have virtue-signalling pencil-necks like NBA commissioner Adam Silver threatening to withdraw his little orange balls unless the cities in which his teams play agree to allow grown men to use the girl’s showers. That’s absurd. And, in truth, everywhere we see “conservatives” retreating from Christianity, or from traditional Christian positions. Just do a search for “The conservative case for”, and up will pop arguments for “conservatives” to embrace whatever is the latest anti-Christian novelty. The “conservative” National Review is a good place to look. While it’s still legal, click here to read the rest. I find it fascinating how weak and terrified atheists are. They are like the snowflakes with their “safe spaces”. If someone hears a word of religion, the atheist is immediately reduced to a crying lump of flesh, quivering in fear that the religion might somehow be more convincing than the atheist argument that there is no god. Atheists are very much like liberals and climate change believers. They KNOW they can’t make a convincing argument, so they have to silence all opposition. It must be very sad and terrifying to be so insecure and afraid 24/7 that you might be wrong or that people won’t think like you do. There are none weaker than those who must silence their critics. If they counted the words, perhaps they even read them. And perhaps that ticked them off. But, dear friends, remember what the apostles of our Lord Jesus Christ foretold. They said to you, “In the last times there will be scoffers who will follow their own ungodly desires.” These are the people who divide you, who follow mere natural instincts and do not have the Spirit. People don’t liked being called out. Especially when it’s accurate. There’s nothing Godly about your comment. An atheist is not bound by a world view which you share, whatever that is. Why is this lost on you? Perhaps you know some funny people. Atheists are made In the image of God. I don’t know any Atheists who are frightened or quivering as you describe. It might comfort you to think it. Quite the opposite, the ones I know seem to be hard nuts. The ones you speak of are the floaters, the drifters who haven’t even decided to start thinking about God. They are the ones you will see in mobs right now, the student zombies. They have learned well from their lecturers. Would you call them atheists in the same way as you might refer to Dawkins? or a mad coke fuelled student? No, people are as different as Christians are different. It’s what you do that counts. I see nothing constructive in describing an individual as you do except catharsis. They need to be taken one at a time, calmly. The ones breaking the law must be arrested and do the time for the crime. 1. Atheists don’t have to make any sort of argument, the burden of proof is on those making the claim that god exists to back it up with evidence or arguments. 2. Have you heard of blasphemy laws? 3. Have you heard of ‘projection’? *American* Atheists are a bunch of tossers. Your Representative will obviously use his own values when determining how to represent you. If you don’t want a particular set of values representing you, don’t vote for him. That said, this is much easier in a multi-party democracy. In Holland there are three Christian parties in parliament to choose between, and even more if you don’t mind them not getting enough votes to have a seat in parliament, of them being some kind of Social Justice or Animal Rights Warrior. I don’t know how this contributes to a response, but it’s funny to think a lost tribe in some jungle somewhere would be as naive about the supernatural as Dawkins and his cohorts. There is such a tribe. They lack even the concept of a god, or a word for such a concept. It was pretty much impossible for missionaries to convert them as they had no way to translate the concept of a god to anything they could understand. As for Dawkins, you know you’re doing okay when people don’t need to use your first name. Sorry, I got your name wrong. My apologies to @ Joy also.